Thank you for playing Happy Wars. You can now transfer your data from Happy Wars on Steam to Happy Wars for Windows, Xbox One, or Xbox 360. You can only transfer data once per account. 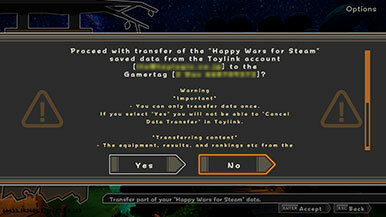 You will be unable to play Happy Wars on Steam after you have transferred data from your account. Please be sure to receive all DLC before transferring your data. Activate the launcher by opening "Happy Wars on Steam." Then select "Transfer Saved Data" on the top of the launcher. To transfer data you will need to log-in to the Toylink Support Service. If you have not created an account you will need to create one. 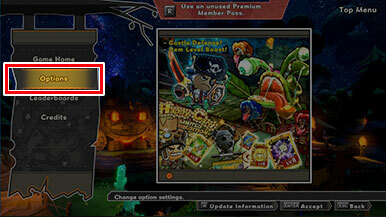 If you have an account, you will be guided to the login screen. Please follow the steps to prepare your Toylink account. Please link your existing Steam account to the Toylink account you created. After the link is complete you will not be able to play "Happy Wars on Steam" on your Steam account. 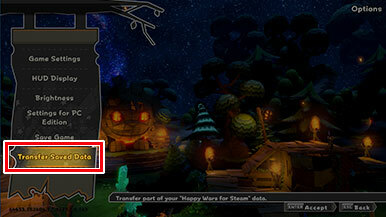 You will be able to play again by selecting "Cancel Data Transfer." Activate "Happy Wars" on Xbox 360, Xbox One, or Windows 10. Please see the pages below for guidance on downloading "Happy Wars." *Transferred data can be used on "Happy Wars" versions of Xbox 360, Xbox One, and Windows 10. Once activated, select "Options" from the Top Menu. Once you have opened "Options," select "Transfer Saved Data." This will then take you to data transfer confirmation. 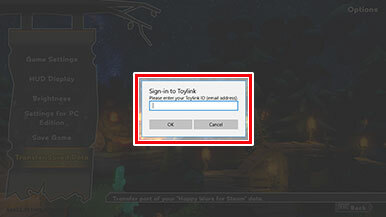 Input the ID and password for the Toylink account you linked to the Steam account in [Step 3.] If the ID and password are correct, you will be led to the data transfer confirmation screen. Please read the warnings carefully before selecting "Yes." Once the data transfer is complete, you will not be able to cancel the data transfer. This means you will no longer be able to play "Happy Wars on Steam" on your Steam account. By following the steps above you will have completed the data transfer. Please enjoy playing "Happy Wars" on your new platform. Is there any data that can't be transfered? The categories below cannot be directly transferred. Please read carefully before transferring saved data. Can I still play Happy Wars on Steam after the data transfer? Once you select "Transfer Saved Data" on your Xbox 360, Xbox One, or Windows 10 account and complete the data transfer process, you will no longer be able to play Happy Wars on Steam. If you have not yet completed the data transfer, you will be able to play Happy Wars on Steam again by following the steps below. Open the Steam launcher for Happy Wars. 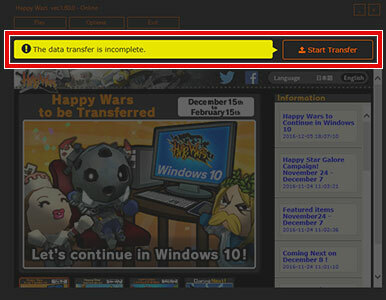 Go to "Toylink" on the Happy Wars launcher and the data transfer cancellation page will appear. Follow the instructions to cancel the transfer. * If the data transfer is canceled on the game platform you are transferring to, your save data may be locked. If this happens, you will not be able to cancel the data transfer. 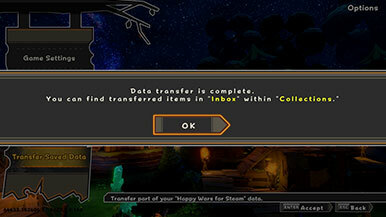 To unlock your saved data you will need to enter your Toylink ID and password by selecting "Transfer Saved Data" on the game platform you are transferring to. Why do I need to create a Toylink ID? 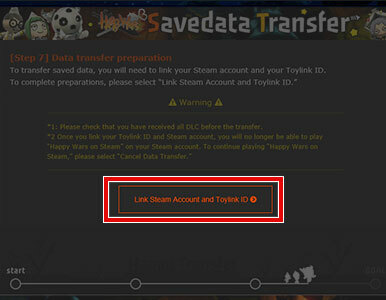 To transfer saved data from Steam to Xbox Live, you need to use the Toylink player support service. After the transfer is complete, will I be able to receive DLC that I purchased from the Steam store? 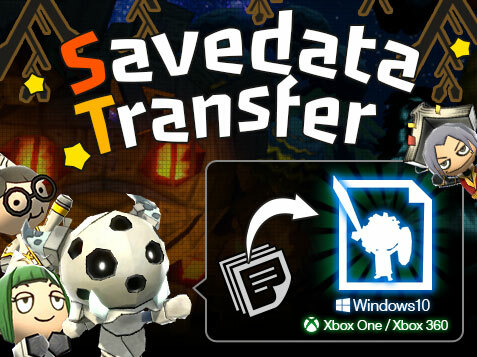 Once you select "Transfer Saved Data" on your Xbox 360, Xbox One, or Windows 10 account and complete the data transfer process, you will no longer be able to receive DLC purchased from the Steam store. If you have any unclaimed DLC, please be sure to receive it from Happy Wars for Steam before you perform the transfer. When do I need to transfer my saved data by? You can transfer your data until 2017-02-16 23:59 (UTC) . Will equipment parameters change after the transfer? Yes. To adjust the game's balance, some equipment parameters will change. The fixed Buff types and number of Buff slots will change for some equipment items, and any Buffs that were removed will be stored in the Buff Bank. To add Buffs to your equipment again, select "Add Buff" from "Item Remodeling". Please refer to the list below for equipment that will be subject to changes.